A fine looking bunch of students at the James Watt Memorial School in December 1949. 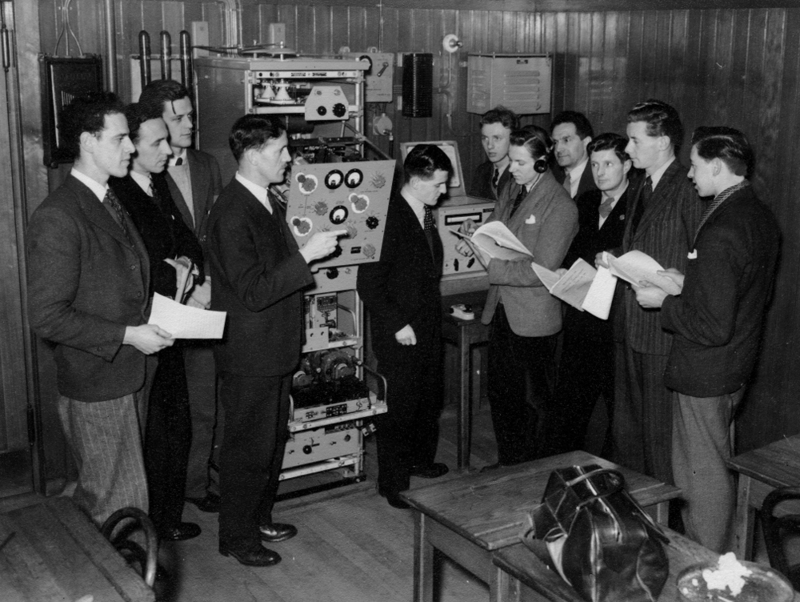 QSO Editor Lennox Mackenzie was a student in this class but at the time was off with ‘flu. ROA member George Stoddart was attending the College at the same time but was a year below. The grey cells for Lennox and George are struggling with names at this range but the lecturer by the Oceanspan is Henry Bolton and it is thought the man directly to the right of the transmitter was from the tug Bustler and was trying to get his 1st Class PMG. To use George’s description “1st Class PMG at that time were like hen’s teeth.” © Original copyright was Graphic Photo Union, but photo now thought to be out of copyright. We acknowledge their original copyright. In January 2015 we have been advised by Alex Nicholson, who was from Stornaway at that time, he is in the corner behind the CR100 and the man on the far right is Mike McNeill from Barra.